I think you're thinking of 2. I hate the mega man legends 2 voices I wish I could either mute the voices or take them out entirely (with the exception of T.Bonne Von Bola and Kmoor). The Japanese version is withstandable only because I think the voices sound better and I don't know if the actors are messing up the script in anyway since I don't understand the language. Nah legends 2 voice acting isn't that bad at all especially compared to capcom's other ps1 classic resident evil. About time. Now all we need is Legend 2 on PSN and I will have all 3 games. I have 1 and 2 on Disc but never could get TB on Disc once Legends 2 is released I will put my Disc up to keep them safe. Today also marks the 5 year anniversary of Legends 3's cancellation. I don't yet own a Vita or a PS3, so unfortunately, I cannot partake in the glory at this time. Given that this is the only Mega Man series I have not touched at all, I look forward to the day I can round out my Mega Man experience. I don't blame you, Legends is one of the greatest games I ever played, a vast world, exploration, great gameplay mechanics, the story, the graphics, it's something too cool for it's era; I do prefer MML over TLoZ:OoT so much. I own a PS3 and I would buy this but I already bought a physical PS1 copy a few years back. Backwards compatability FTW. Well all PS3 consoles can play PS1 games but not all PS3 consoles can play PS2 games! So technically all PS3 consoles have some form of backwards compatibility. Gotta agree, at that time this game was actually pretty good. The world, many voice acting, alright graphics. I even suprised that Zelda OoT got better opinion. Prepare for Legends 2, anybody? IT'S OUT! https://store.playstation.com/#!/en-us/games/mega-man-legends-(psone-classic)/cid=UP9000-NPUJ00603_00-0000000000000001?utm_medium=Social&utm_campaign=Batman_Day&utm_source=US_PS_Blog_Post&utm_term=so-ga-5-82749&utm_content=Batman_Day_US_PS_Blog_Post&emcid=so-ga-5-82749 for PS3,PSP and PS Vita! I'm sorry but what, Z-Targeting? I've played Legends countless times, and I do not recall there being any sort of targeting mechanism. Also in fairness, Ocarina of Time had been in development for many years before its eventual release, sometime after they finished ALttP. I don't know how long Legends was in development for, but I don't think it was as long as OoT. I wouldn't say an earlier release date necessarily means it was the first to innovate the features now characteristic to the Zelda franchise. Like no lie, I love Legends a lot, but I have to question that. No Legends invented the 3D targeting mechanic familiar with 3D action adventure RPGs, Zelda then innovated that mechanic. If this were reverse and Zelda came like two days before Legends, you'd never hear the end of it, it would be constant Legends is a rip off of OoT, heck even though Legends came out first it's still considered a ripoff of that game anyway by a buch of fanboys and casuals. That said OoT is a million times better than MML and MML2(which I consider the first better than anyway), at least in my opinion. You are mistaken, friend. Mega Man Legends absolutely had a targeting system. Despite launching almost a full year before Ocarina, I'd wager both Capcom and Nintendo had the idea all by themselves. No one necessarily needed to rip off anyone else to figure out what needed to be done for combat in a 3D space. Hold R2 to lock-on to a target. You can't move, but that is the primitive Z/L-Targeting system Protodude is referring to. I believe the controls are updated in Legends 2 to be more similar. Alright, so it had one. Though I still have to question the notion of Legends being the first to invent it. The Nintendo 64 version of OoT (previously they were making another SNES Zelda before moving to that) started development in 1996, though also believed to be developed concurrently with Super Mario 64 so it may have been earlier that. I don't know when MML started development, but the earliest mention I can find was 1997. I find it much more likely that Z-Targeting was developed in OoT first, especially when they changed the perspective from first-person view to third-person view. There's also very early screenshots of OoT likely from 1996 which has Navi in them, who was believed to be implemented to better illustrate Z-Targeting. Doesn't matter. He said it included primordial Z-Targeting, and it does. There's a chance that Capcom was inspired by OoT's mechanic while both games were in development, but in the end it doesn't change how amazing the 3D Zelda and Mega Man Legends games are. What we really should be complaining about is how Despicable Me's Minions are a clear ripoff of Sevbots, but I digress. No way Mega Man Legends was made the same year it was released (especially with MM8, MMX4 and it being developed around the same time), and with all due respect, you sound like a Zelda fanboy trying to score points for your game by comparing it to Mega Man Legends as a precautionary measure or something. Fact is Mega Man Legends was released December 18th 97, OoT November 21st 98 nearly exactly a year after Mega Man Legends. Mega Man Legends came with a fully integrated lockon system first to the market. It is credited with the invention, after that it is all innovation from there on. I'd like to also add that I believe Mega Man is the first console game to have a nonlinear stage selection system, if you wanna play that game. ;P Before you talk about save, I credit that to hardware not software. Even though I think OoT is an exellent game and Mega Man Legends good and MML2 fairly mediocre, I will acknowledge MML as the inventor of the lock on. E3 1997 showed OoT with Z-Targeting. What was the first year that we got pre-release footage of MML? What year was MML announced to be in development? What I'm basically saying is, released first =/= first to invent and implement a feature. Unless I'm given actual pre-release facts instead of "MML was released first, therefore it invented it first", then I will still believe OoT was the first despite being released later. And sure, call me a Zelda fanboy if you want. I don't give a damn. All I'm wanting is facts, is all. Shown lock on in a trailer or fully playable lock on released in the same year. Yeah still waiting for proof that Zelda invented lock on, or that Mega Man Legends had anything to do with being inspired by OoT's lock on, or that lock on was implemented into MML late in its development which is suppose to have been concieved and fully developed the same year it was released on. Zelda was released in 1998. I said that the E3 1997 build, which was still early and shown only as a preview, had it. Plus, screenshots shown prior in 1996 that had Navi in them. I'll just post this video then, which has been my biggest source thus far. I should have just posted it sooner. Meanwhile, I'm going to lengths to show that Ocarina of Time implemented Z-Targeting prior to year 1998, and you're not giving me anything in regards to Legends' development. Lol. You are a Zelda fanboy. Facts are, Mega Man did it first, and you can't really prove it didn't, so yes you are in fact a fanboy who is digging for relevancy where there is none at all. Over the years Mega Man has had a lot of firsts that other game get credit for because of popularity. This is old news. What lengths? You only now linked a source, and it is from an amateur documentary. Like I said before, even if I were to accept that Z-targeting was shown in E3 97 that still wouldn't prove that Zelda invented lock on since MML was released that year fully with a functioning lock on. A magazine with pictures of Navi in the gameplay doesn't prove anything either except that Navi was in a screen shot in a magazine. Meanwhile, while you are "going to lengths to show that Ocarina of Time implemented Z-Targeting prior to year 1998", I going to lengths to show you how to use common sense and figure out that Mega Man Legends wasn't made in a few months since A. the technology and game design it was being developed with was revolutionary, costly and unfamiliar at the and B. Capcom even though to this day is considered to have a small dev team, had an even smaller one back then and where working on 3 (not including other franchises) games for the 5th generation with brand new aesthetics, brand new console tech, and programming around the time splitting the team that made MML. There is no way MML was conceived and fully developed the same year it was released. 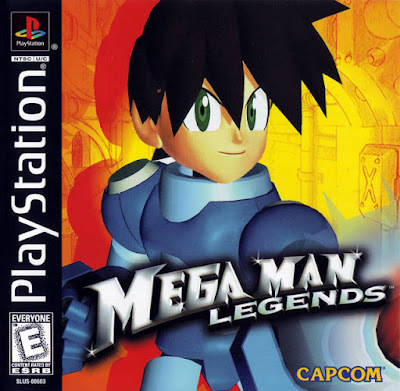 In fact the proposition for Legends started before MM8 was released as Capcom wanted to make a 2D Mega Man for the PS but Sony only accepted in the condition that Capcom develop a 3D Mega Man game for their system, which immediately prompted the development of MML (source G4 icons Mega Man GC anniversary collection). You know how I know you're a fanboy trying to score points for Zelda. "I've played Legends countless times, and I do not recall there being any sort of targeting mechanism." Well how the hell did this happen, how do you play a game countless times and not know of its single most broken and obvious mechanic, the game literally forces you to notice lock on in its mandatory tutorial. Mega Man Legends should have been called Mega Man Legend of Zelda, since it has way more in common with that series than a traditional Mega Man Game. 1. It has no sense of Stage Selection, you have to play the game according to the way it naturally progresses, yeah sure you can sidetrack in ruins (a Zelda trait) and stuff but you can't for example do a mission out of order. 2. It has a town hub with progressive sections and lovable NP town folk, side-quests, inventory shop/salesmen and junk. Think of how much that affected the game, could you imagine how different the game would feel if the main hub was a lab with a NPC or two in it? Now think how many Mega Man games have that feature prior to MML. Also even though games like MMZ and ZX implemented a hub world they still felt like an expansion to the stage select mechanic, as if like a fleshed out MM7. Theme: No other Mega Man game focused on relic hunting, ruin exploration or a focus on history/past like MML, it's a complete turn from the past series that was mostly about technology and current/future events. There is no sense of Robot Masters (like Mavericks to MMX, Guardian/Boss/Judges/Einherjar Warriors to Zero, Pseudoroids to ZX, Darkloids/Navi Bosses etc) and Mega Man's (or the main character's) dynamic with them (getting there powers). Instead it's mostly just random dungeon bosses (a Zelda trait), or Bonne bots (friendly enemies like Eggman or something), with a kinda random final boss. The story telling was also a big departure than previous titles, with more emphasis on script and dialog than action event based progression. The music was more like a mix of jingles and moody atmospheric ambient music, with an occasional theme (Zelda traits) than fully composed melodic themes played throughout the entire game like most Mega Man soundtracks. It just was very different from Mega Man, the only relation I see with Mega Man is some small aesthetics to character designs a vague connection to the Classic timeline's continuity, and the ability to jump and shoot but done in a very different light than in other Mega Man games. That's OK but I hate when fans try and pretend it is very Mega Man. Well I chalk up the control scheme to Capcom not really wanting to mess with what worked for their action games, also it was all configurable. But yeah it makes sense kinda to say that it's "Mega Man-ish" I guess. *Circle for dash/skate* The problem I have with that is yes you can skate, but it is nothing at all like dashing or any momentum based ability in the 2D games, it is not a burst of speed and maneuverability, it's more like a slightly faster run (with a long startup). The thing I'd compare best with the dashes/slides of the 2D MM games from Legends is the side cartwheel, but even then I think Link's roll is more relatable to Mega Man dashes/slides. *Changeable/Upgradeable* but again they all operate wildly different than any weapon in Mega Man, even the buster upgrades are very different, never before was standard pellet shots made to be bigger faster moving and stronger and travel longer/further. Heck it was the first time rapid fire was an actual gameplay mechanic instead of a peripheral hardware attribute, something that I think to this day only 3 MM titles have (MM&B, MM10, and MMX8 I believe). Not to mention every single MM title since 4 has had a main buster charge shot in some form or another. Also Link gets upgradable projectiles as well, can switch from any sub weapon at any time in the sub menu, and can even charge his main attack (much more MM-like). *Upgradeable leg, foot(? what in Mega Man X upgrades his feet? ), chest, head, and buster parts* Same can be said with Zelda, just switch buster with sword and chest with shield. *Bosses and mini-bosses are usually robot animals* Same can be said with Zelda monsters, they are usually based on animals. Not to mention the whole eye theme similarities in both it and Legends. *Go to Roll or mechanical store to buy upgrades* I say that is more Zelda than MM. *A single base of operations for our hero* I believe MMV/T has many bases of operation. Flutter, Roll's car, City Hall, Sulphur-Bottom to name a few. *Intro stage that cannot be revisited* Yeah Capcom is annoying with that. That is a double edge comparison though since MMV/T can only really travel traditionally to areas, and rarely teleports like every single other MM does all the time. Meh, whatever then. Call me a Zelda fanboy, use it as some petty insult then. Like I said earlier, I don't give a damn. Also, I did play Legends countless times some years back. I just didn't use the damn lock-on. I was fine shooting without it on normal and hard. But whatever. I wasn't trying to insult, I'm just calling it how it is. Thing is fanboys don't really know that they are fanboys. They are like a mother trying to defend their baby at all costs, and blinded by that bias, even when told they are being biased by the very loved ones they are protecting. See this >https://youtu.be/jXutpYdD5MI?t=97 It is literally mandatory, if you do not target up and shoot that jerk on the ceiling Roll runs all the way through the ruins to your location and drop kicks it off the ceiling for you, then slaps you upside your head and says you'll never get a woman, and to go home p***y, where from then on you are called Micro Baby in the English version and Softboy in the Japanese version. On a slightly more serious note, lock on is also useful for directing position, if not for that you'll be slowly doing a what feels like 2 hours worth of what feels like an 8000 degree turn just so you can see the sign telling you to turn the other way. do people not remember rockman neo demo that came with RE1 or RE2 for japanese ps1? it was a fully functional demo to showcase megaman in 3d for first time before it became known as rockman dash aka megaman legends. want another example? megaman x4 has a demo for legends only for japanese audience. Yes, I am well aware upgradeable health was a staple of the Zelda series a year before Mega Man 1 was released, and (as far as I recall) it wasn't until MMX1 where that mechanic was brought into that series, but I consider its inclusion in MML to be a nod to X, not Zelda. Yes, Zelda games have shops, but specifically going to Roll (Mega Man 8 - style) or a (/Auto's) hardware shop (Mega Man 7 - style) I find to be closer to a nod to those games. Just because a game has a shop doesn't mean it is taking it from Zelda. That isn't fanboyism - I consider a return to a concept from a previous entry in a series a nod to that entry and not a nod to a series that did it first, because at that point it is a pre-established trait of the series. Like how the falling logs in Sonic Lost World are likely a nod to the Game Gear version of Sonic 1 than Super Mario Bros. 2 USA. Why can't we just enjoy the fact that MegaMan Legends is on PSN other then doing "MML VS OoT SHOWDOWN EXTREME!" Well of course it is gonna have some similarities to a Mega Man game, for goodness sake Capcom can't be that transparent about it. They can't just make a game and title it Mega Man then have all the content inspired by and based on another franchise or genre entirely. I don't think you're being a fanboy or displaying fanboyism at all though, you seem to be approaching the comparison logically. I didn't know you were only speaking for Legends and not 2, but with that said I will also agree with you that Legends 2 is much more Zelda like than the original. @Alex I wrote a comment but I don't think it got through. So I'll break it down. 1.I don't think you are displaying fanboyism. 2. I don't think Mega Man Legends is a 1.1 image of Zelda, it does have traits related to Mega Man. I just find it shares more with Zelda. I have 1 on disc and Tron Bonne as a download, I'll buy this to play it on my PS Vita and PSP, support Legends, and raise the chances of Legends 2 being rereleased. I'm having a blast with this game on my Vita. :D There's a tiny bit of lag in the Apple Market and some other places, and it doesn't feel quite as good as the PSP ports did, but it's so awesome to have the game available in English on a handheld (... legally).